Hundreds of people hold a rally in support of Tzvi Strook, convicted of kidnapping an Arab and beating him. He denies it. 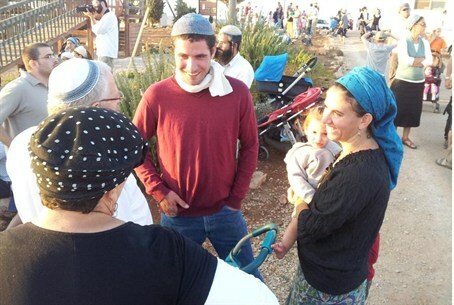 Hundreds of people came to the Binyamin community of Tel Shilo on Wednesday, where they held a rally in support of local resident Tzvi Strook, who is expected to be entering prison after the holidays. Strook was convicted in November of 2010 of kidnapping an Arab, beating him and causing him serious bodily harm. His indictment alleged that he, along with another man, beat a PA Arab shepherd and dragged him onto a tractor. The shepherd was injured and consequently lost consciousness, claims the indictment. Strook denied the accusations against him all along and said they were false. His legal council said that the police work was sloppy and that the testimonies by the Arabs were contradictory. The case rested on their testimony. In August, the Supreme Court accepted the State's appeal over the sentence imposed on Strook and determined that he will serve 30 months in prison instead of the 18 months to which he was originally sentenced. The judges also rejected Strook’s appeal over his very conviction and the severity of the punishment imposed on him. Itzik Shadmi, Chairman of the Committee of Binyamin Residents, told Arutz Sheva during the rally, “As you know, there is a fight over the area and the Arabs are doing their best” to drive out the Jews from the area. Friends of Strook who attended the support rally told Arutz Sheva that they had planted hundreds of dunams of trees in the area. They stressed that they will not be deterred by Arab lies and their attempts to take innocent Jews to court and will continue to plant and build the region.